The world's most outstanding commercial animation, VFX and motion graphics on DVD - 12 times a year. When you subscribe, you'll receive 12 spectacular DVDs, one per month, starting immediately with the newest issue. Or, if you wish to start your 12 month subscription with a previous month's issue, we can arrange that for you, shipping those back-issues to you along with the newest issue. 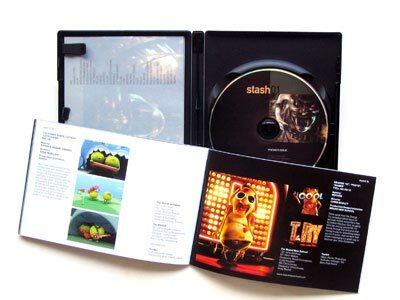 STASH delivers the planet's most innovative and outstanding commercial animation, VFX and motion graphics plus insightful behind-the-scenes extras in a monthly DVD magazine. Also tucked inside the STASH DVD case is a companion book of color stills, details on the featured work, credits and tech notes. 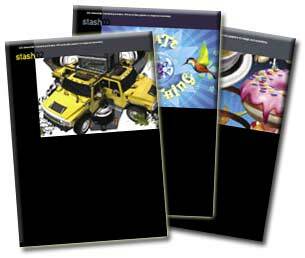 STASH is the essential resource for ad agencies, broadcasters, animation and VFX studios, designers, post houses, production companies and schools. * Free shipping is for destinations within the United States, using Priority Mail via the US Postal Service. If you are in another country or want expedited shipping, we'll cover the first $6.00 of your shipping per package, but you must pay any additional cost. Order your subscription to Stash DVD Magazine today!